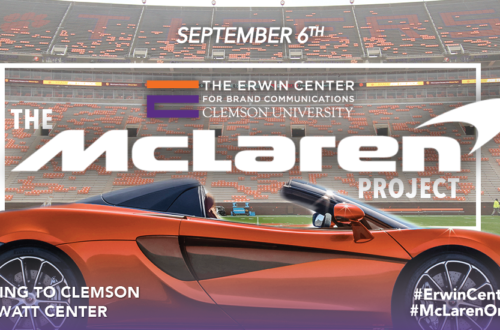 Stories tagged with "Erwin Center For Brand Communications"
The Erwin Center for Brand Communications at Clemson University is gearing up for the 2019 edition of its Erwin Center Summer Scholars program. The second annual week-long camp, which helps prepare minority students for jobs with leading brands and agencies, will be held May 18-25, 2019. Applications are due March 1, 2019. United Kingdom-based McLaren Automotive is tapping Clemson University students this semester to help the high-performance sports car manufacturer reach a new set of consumers. The Erwin Center for Brand Communications students will be tasked with developing an advertising and marketing campaign to help McLaren reach “lifestyle” sports car enthusiasts. Students representing nine colleges and universities in both Carolinas are learning about the impact of effective communication during the first Clemson University Erwin Center Summer Scholars (ECSS) program. Clemson University’s Erwin Center for Brand Communications has named advertising and digital marketing professional Katie Hildebrand as its new executive director. Upstate residents Joe and Gretchen Erwin of Greenville will improve the future of Clemson University students, faculty and staff and the business community with their $2.5 million gift, including $1 million for the new College of Business building and $1.5 million for a student scholarship and programming support for communication students and adjunct faculty.